WebLogic JMS has a feature for compression of in-flight JMS messages. Compression happens between the JMS client library and the JMS server. This avoids bandwidth issues and nasty problems with maximum message size limitations (see http://thomasrischbeck.blogspot.ch/2012/03/jms-maxmessage-size-persistent-messages.html). Dynamic compression can be enabled on the JMS connection factory. Here you specify a threshold in bytes. If the serialized message body exceeds this threshold and if the client is not collocated then the message payload is compressed in-flight. 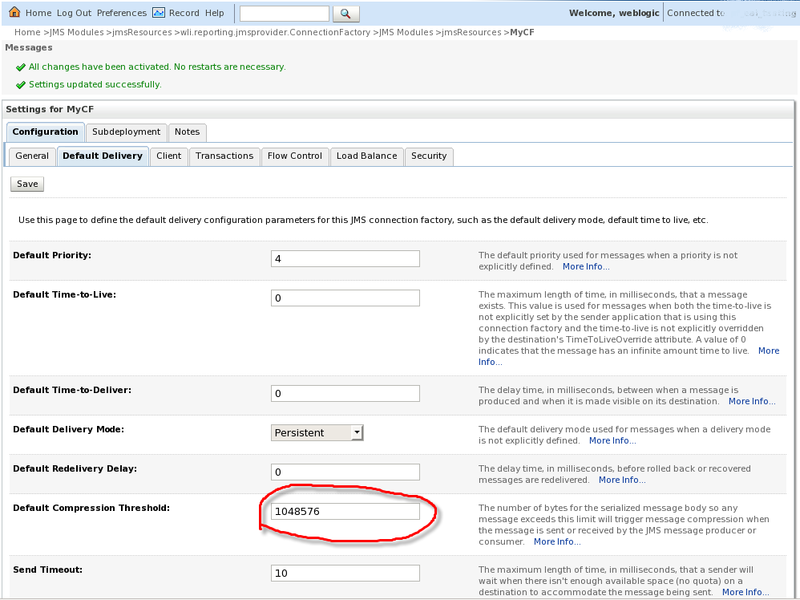 See Compressing Messages in the WebLogic Performance and Tuning Guide. An alternative is to programmatically set a compression threshold via WLMessageProducer interface.